When you start snowboarding, it is perfectly natural to feel a bit nervous about your first jumps. Here are some incredibly easy and simple tips that will get you started. These tips are meant for snowboarding beginners who can practice them and get a good hang of them at park jumps before moving on to more advanced level. A typically park jump has 4 main parts. These include the lip, the flat area, the knuckle and the landing. The lip is the rising portion from where you approach a jump. The purpose of a lip is to give you an ascending movement so that you can rise into the air and make a proper jump. The flat area is, as the name suggests, a flat portion of snow which begins right where the lip ends. Think of it as the plateau of on a hill. Your job is to clear the flat area completely during your jump. In other words, you should ideally go flying above the flat area and land well beyond it. If you land in the flat area, then you are too slow or you aren’t using your legs to jump off the snow at the end of the lip portion. Right next to the flat area is the knuckle. This is a slight protrusion in the snow and you can think of it as the lip portion at the other side of the jump. Much like the flat area, you should aim to clear the knuckle in your jump. If you end up landing on the knuckle, this will unbalance your landing. Finally, the fourth part of a park jump is the landing. This is the sweet spot where you are supposed to land during a jump. So when you approach the lip, you should ideally have the right speed and jump sufficiently in the air to clear the flat area and the knuckle, landing smoothly in the landing. That would qualify as a good jump. Now that you know the shape and structure of a park jump, it is time to understand how exactly to jump using a snowboard. There are two basic methods of jumping using a snowboard. The first method is quite straight-forward. Use both your feet to jump up into the air, much like you would normally jump. For this, you need to slightly bend your knees and then push your feet against the snow, jumping into the air with your snowboard. The other method is called an Ollie. It is essentially a method which involves making a jump using your back foot. In this method, you yank up the tip of the snowboard by pulling up the front foot while using the back foot as a peg for a moment. When the front is in the air, make a jump using your back foot. This would complete the jump and your snowboard would be in the air. 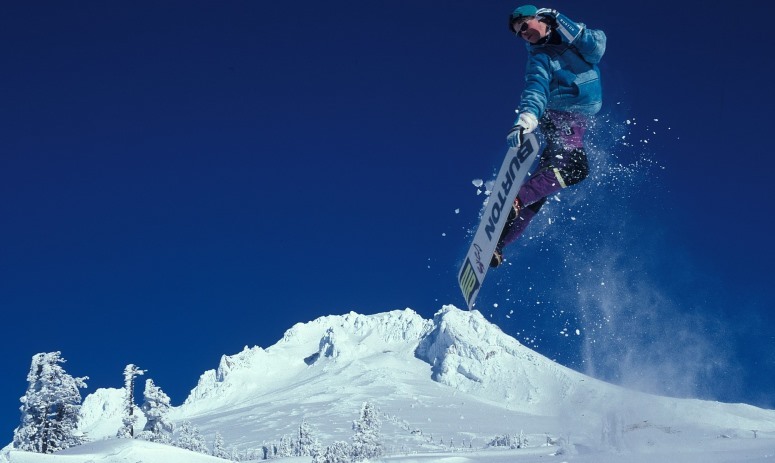 As with other aspects of snowboarding, it takes some time to master both methods of jumping. It’s best to try them out on flat runs on the snow before you try them on a park jump. When you approach the lip of a park jump, as mentioned above, you should ideally clear the flat area and the knuckle to touchdown on the landing. In order to do so, you need just the right speed. If you approach a lip too slowly, you will not be able to jump high enough and you may end up landing in the flat area or on the knuckle. If you go too fast, you may clear even the landing and touchdown beyond the landing area which is again, not the ideal scenario. You will need to practice a few jumps before you are able to judge just the right speed. With practice, you will be able to find the right amount of speed you would need in order to reach the landing on the other side. In snowboard jargon, to pop is to push with both your feet as you reach near the end of the lip in order to get into the air. Pop is important because it gives you the right momentum and balance to rise into the air during a jump. The right way to pop is to bend your knees slightly and just when you are about to reach the end of the lip, fully extend your legs to push against the snow. This will lift you up into the air and with the right speed, take you across to the landing area. A critically important part of a jump is the body position. The posture or the position of your body during jump greatly impacts how you rise and how you land. Let’s talk about the take-off part first. The take-off is where you jump up and rise into the air. At this point, your shoulders should be perfectly parallel to your snowboard. So since your snowboard is vertically aligned in front of you, your shoulders should be similarly positioned, with the front and back shoulders both positioned above the length of the snowboard. Beginners often make the mistake of losing the shoulder posture during a jump. If you look on either side, you lost the posture. If you turn your shoulders for some other reason, you lose the ideal posture. And the moment you lose the posture, you also lost control on the snowboard. The snowboard will turn exactly where your shoulders are turned. So if your shoulders are aligned above the snowboard, the snowboard will head straight ahead. If not, it will go wherever your shoulders are turned. Another important thing to remember is that you must stay balanced during a jump. If you lean back, you will lose the balance during the landing. Finally, while you are in the air during a jump and when you are landing, keep your knees slightly bent. This will give your body a flexible posture which will help you stay balanced on the snowboard and also while landing back on the snow.